The 30,000 plus crowd of people are cheering as the batter steps into the batters box. The pitcher throws. The batter swings on a strike. The pitcher throws again. It is a ball. The pitcher throws for the third time. This time the batter connects driving the ball between the shortstop and the second baseman. A runner scores, and it is 1-0 in the first inning for Akita Shogyo against Ryukoku. Never heard of the teams? It is probably because not a lot of people follow Japanese high school baseball. 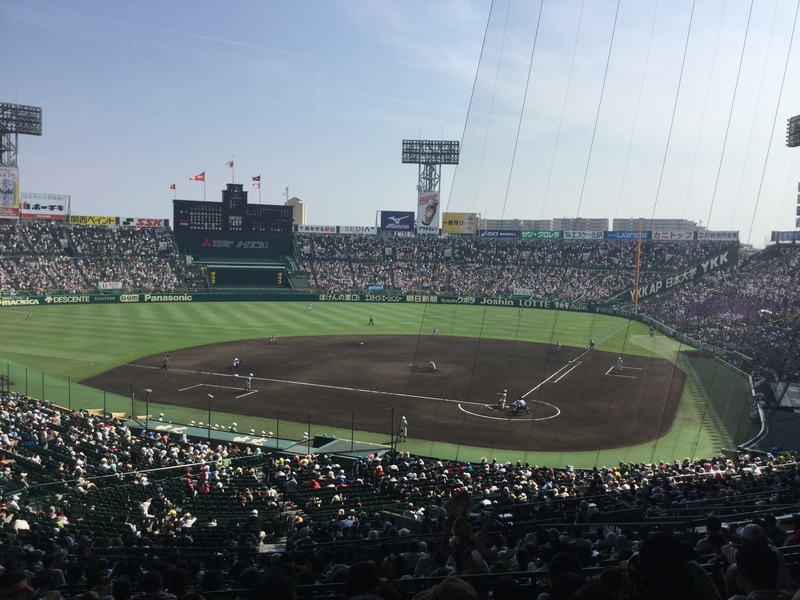 The National High School Baseball Tournament of Japan takes place annually at Koshien Stadium. This is the 97th tournament but also the 100th anniversary of the first tournament. Each of the 49 prefectures (like states or provinces) sends one school team. The tournament lasts for 15 days in August. It is a single elimination set up meaning a team cannot lose. The rules of baseball are the same as they are in the United States, Canada and the rest of the world. How the Japanese play is a bit different. There is a greater emphasis on bunting, base stealing, base hits and trying to create runs rather than hitting home runs. There is a set time on games lasting until the 15 innings. In most places like the US or Canada, they play until there is a winner. Koshien Stadium is one of the oldest baseball parks in the world built in 1924. It was constructed to host these National High School Baseball Championships. Later it became the home of the Hanshin Tigers, Japan’s oldest professional baseball team. The stadium holds 48,000. During the Championships, there is free admission for the majority of the games. The Japan Times Newspaper estimates over 800,000 people will come to see the games over the 15 days. Inside the stadium the two schools playing each other sing school songs to cheer on their teams. There are loud cheers when there is a hit from one side of the field while silence from the other side. Beer, dried squid, sushi and other snacks are served. The game resembles an American college football game. All games are broadcast live throughout the country on Japan Broadcasting’s (NHK) three channels. The tournament generates a lot of money for its main organizer the Asahi Shinbun Newspaper. The publicity creates a lot of advertising for the participating schools. Some, like newspaper Jitsuwa Bunka Tabooa, have argued this exposure does great harm. It puts enormous pressure on high school aged kids. School leaders see doing good in the tournament as a way to promote the school. Pitcher Hiroki Kuroda of the New York Yankees told the New York Times how, during his years as a high school player, he was forbidden from drinking water during long practice sessions. He was forced to take part in punishing drills that went on until players dropped from exhaustion. Bullying from coaches and older teammates were also part of playing high school baseball. One of the punishments he remembered was being forced to drink water from a toilet. The temperatures for the game are in the mid to high 30’s. It is the fourth game today. There are no clouds in the sky. Sitting under the covering from the sun makes the game more comfortable to watch but out on the field it is hot. The pitchers for both Akita Shogyo and Ryukoku are throwing baseballs around 132 km/hr (82 mph) in the late 8th innings. In the top of the 9th inning, Akita gets three more runs off of singles to win the game. The losing team bends down to collect the dirt of the field to remember the experience. For a majority of them, it is their last high school game. The two teams line up and the school song of the victor is played. They bow out of respect for the umpires and then to the opposing team to end the game. There are four more games tomorrow.